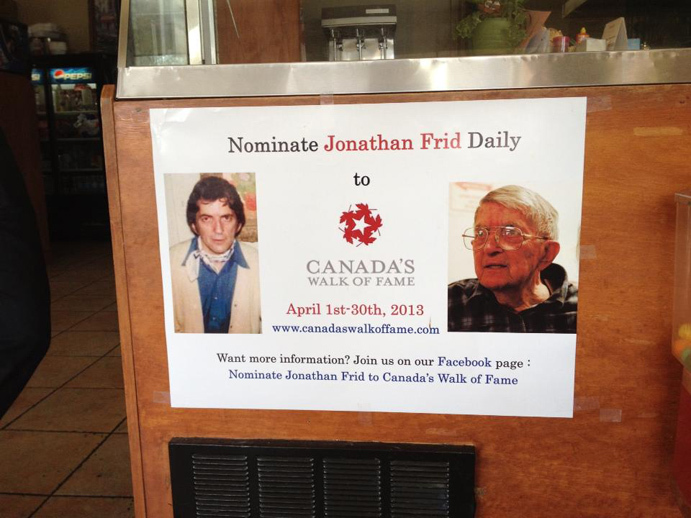 Jonathan Frid's "Walk of Fame" campaign poster, on display at Sammy's Restaurant in Ancaster, Ontario. "I just called Canada's Walk Of Fame headquarters in Toronto, May 6, 2013 and they are now telling me announcement of the 2013 Inductees will be well after June 25th. The board of directors of CWOF is having a meeting right now 5/6/13 @10:19am. They will hold a press conference after the 25th and will release their decision to all of their media outlets then. Sign up for CWOF's Email and you will be notified on your FB news page. We will notify everyone here too."